Welcome to 2016 ! I can’t believe another year has passed and we’re on to bigger and better things in our lives ! For many the holidays are all about family. Family makes us who we are today and they are the support we need to move forward to the future. However, knowing what your family has come through over the years is also an important part of who you are as a person. 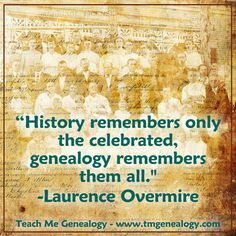 Over the next few months I’d like to walk step by step through the process of family research better known as Genealogy. Each week I’ll talk about something new and important to help you on your way to finding out more about your family tree and exactly how many nuts you have on it. 🙂 So, let’s get started ! After you’ve asked all of the questions from anyone and everyone in your family. Search through your attics and basements for things that might give you more information. Things like family Bibles or old address books, letters and newspaper clippings. Gather all of these things together so you can have some sort of starting point for your search. Have fun and enjoy reliving those memories with your loved ones ! Next week we’ll discuss putting things on paper and organizing the information we’ve found.